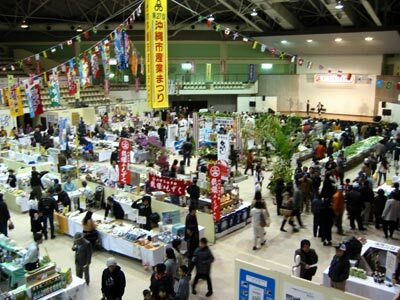 An opportunity to go shopping, sightseeing and an educational excursion roll into one this weekend as the Okinawa City Industrial Festival presents the latest in local products. The two-day festival Saturday and Sunday ties Okinawa culture and customs together with a chance to sample--and buy--locally made goods. The events center around the Okinawa City Athletic Hall near Kadena Air Base Gate 5. The festivities kick off Saturday at 10am with ceremonies an a performance by a children’s fife and drum band. More music takes the stage at 1:30pm with the Yamauchi Junior High School Band. City officials producing the festival say the first 200 adults to visit the Industrial Fair after 2pm will receive seedling plants. Similarly, the first 200 children checking in after 3pm will receive free sweet rice cakes. Organizers expect the music and food to attract thousands to the Industrial Fair, where the key word is “local” products. Everything on display and being sold in Okinawa City is manufactured / handmade in Okinawa City. City leaders say they’re proud of the city’s ingenuity and production skills, and view the Fair as an ideal outlet for introducing the pottery, foods, textiles, herbs, kimonos and soft drinks. In fact, booths were available only to local manufacturers and artisans. Free shuttle busses will run from the Okinawa City Offices to the Athletic Hall throughout the weekend. Parking is limited at the Athletic Hall. Saturday afternoon promises more outdoor fun with a street dance show at 2pm, a song festival at 4:30pm, and a jazz concert at 5pm. The evening wraps with an impersonator show starting at 5:30pm. Sunday’s Industrial Fair timeline begins in the early afternoon with a children’s samshin performance at 1pm and a gymnastics program at 1:20pm. Okinawa Shimauta Music Program is at 2pm, and a repeat performance of the ever-popular impersonator music show starts at 3pm. Jazz again takes center stage at 3:30pm and dancing is an opportunity for everyone to get involved at 6pm. The program closes with an awards ceremony at 7pm. Okinawa City is going all-out to promote its local craftsmen and manufacturers. 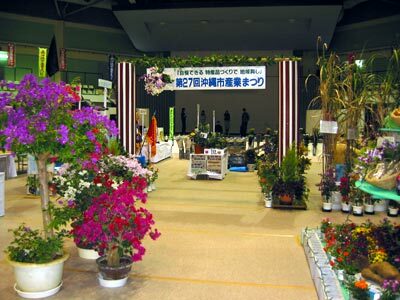 This year’s festival has attracted visitors from Yamagata Prefecture, which will introduce its industrial goods. Niigata Prefecture and Chibana are sending delegations, including committees to study local fabric production.